Crafting is a multi-functional feature in Counter-Strike Online, allowing players to apply modifications to their own weapons, including performance enhancements, painting and disassembly. Enhances a non-premium weapon by [+1], up to [+5]. Has a chance to succeed, fail or downgrade. Enhances a non-premium weapon by [+1], up to [+8]. By collecting 30 enhanced reinforced parts from failures and downgrades, they can be exchanged for a Guaranteed Advanced Enhancement Kit, with 100% success rate. Magnum Drill Premium Enhancement Kits are only used to enhance Magnum Drills. Removes all enhancements on a weapon, resetting the enhancement level to zero . Does not apply to Premium weapons. 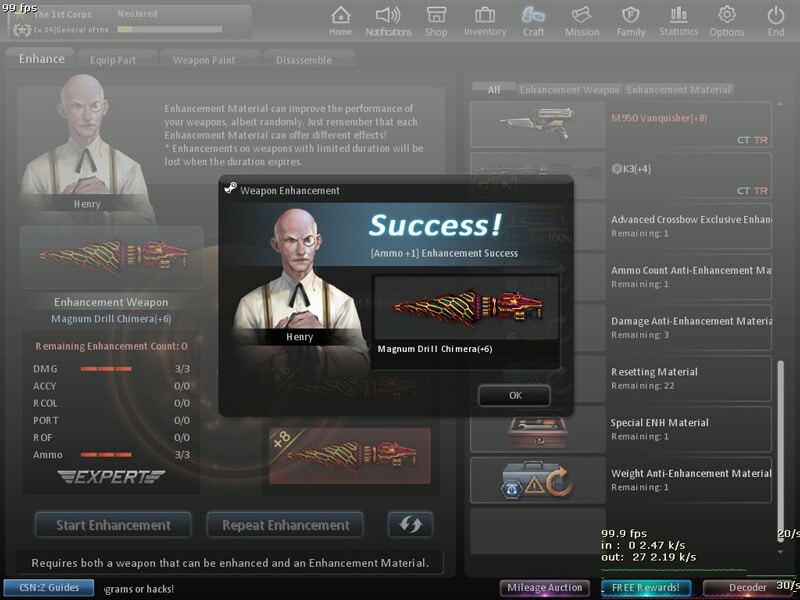 As stated above, enhancement from normal and advanced enhancement kits could succeed, fail or even downgrade, all which are totally random. Most weapons have the maximum enhancement levels of [+8], with [+6] and [+7] bearing the EXPERT title and [+8] being the MASTER title. Weapons with these titles undergo cosmetic changes, as illustrated below. Golden and Christmas-themed weapons however, are not affected by cosmetic changes, even with Expert and Master titles. Unlike the previous Weapon Enhancement which covers most game modes, the Weapon Parts feature only applies to both Zombie Modes and Zombie Scenario. Furthermore, a smaller selection of weapons are eligible, including certain stock weapons such as the M249 and Desert Eagle. Importantly, this allows new players to use their basic weapons to fight back against zombies, providing a level playing field with veteran or cash players without the need to own premium weapons. Installations are limited to a maximum of 2 parts per weapon. While weapon parts are given out during events, they are also obtainable from playing on Zombie Scenario and Zombie game modes. Pimp up your weapons with various paint designs. Just grab a paint off the Store, choose a desired weapon and hit the “Start Painting” button! Once the paint has been applied, it must be manually removed before applying another one. Also if you’re a creative artist, join Paint design contests held by different publishers (e.g. Nexon, Gamania, Tiancity) from time to time. Who knows, you might get your design featured in all Counter-Strike Online versions? If you have one too many duplicated weapons, the disassembly feature is what you are looking for. By disassembling or recycling both permanent and time-restricted weapons, you receive weapon parts and Duration Extenders. Duration Extenders, as the name implies extend a weapon’s duration as specified by the user (minimum 1 day). As they are stack-able, they allow most time-restricted weapons to be extended up to 1,000 days, making them permanent.